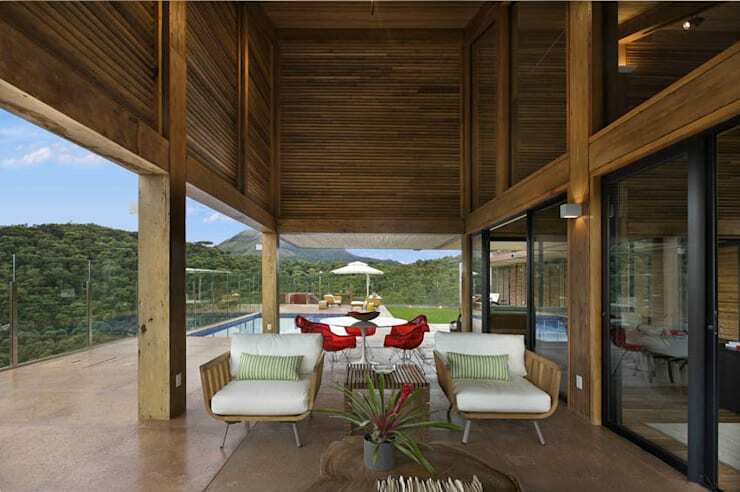 The Brazilian home we will explore today enjoys almost 360-degree views of an ecological reserve. The mountainside setting forms the perfect backdrop for a grand natural retreat and the architects have certainly taken advantage of all it has to offer. The property lies on a slightly sloping block and has few neighbours. 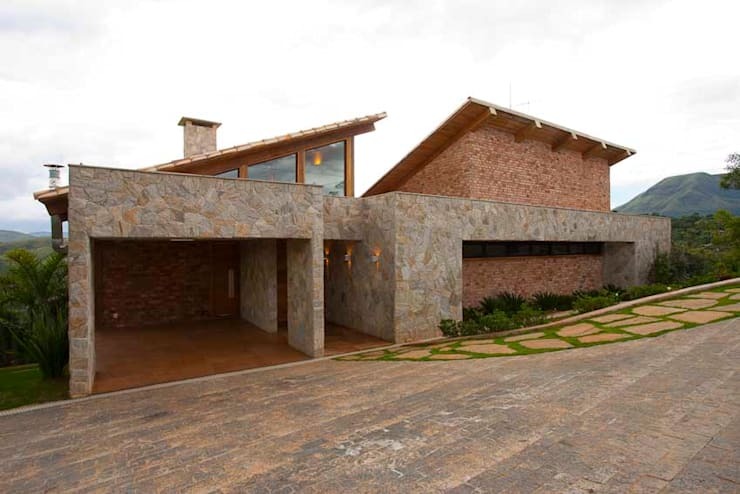 The simple, contemporary facade is composed of wood, stone and concrete. These three materials are predominant throughout the house. The property is mostly orientated towards the rear views, but there are some high upper windows visible from the street frontage. The slope of the site allows for a second level at the rear of the home. Here we have a glimpse of the great verandas and outdoor entertaining areas. On our left we have the wood venetian blinds that have been used throughout the home to enable cross ventilation. In the upper foreground we also have a good view of the lovely bamboo shade. The large pool and spacious outdoor entertaining areas have been created to create a sociable atmosphere. The various zones allow the generations of occupants to engage in different activities, from swimming to chatting and easy contemplation of the beautiful surroundings. A key part of this was an emphasis on nature. 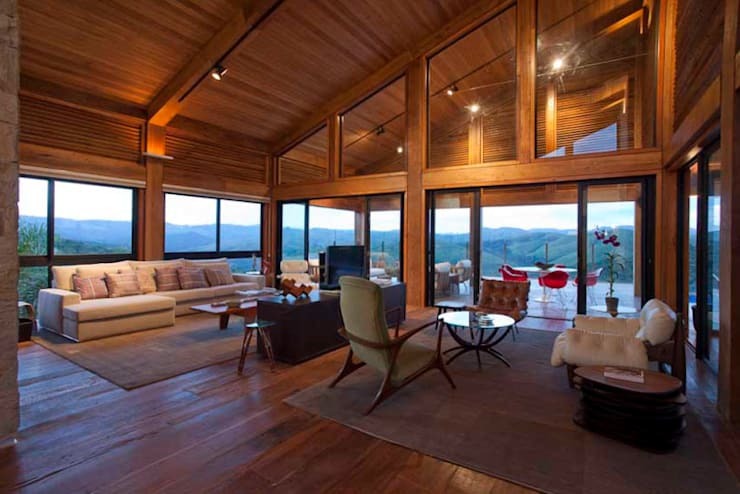 The glass wall to our right is transparent and allows unimpeded views of the surrounding mountains. Finally, note the large roof mass that appears to be a second level. This is not a second level, but a feature used to create double height ceilings throughout the home. From this angle we have a good view of the high ceiling that forms part of the veranda. 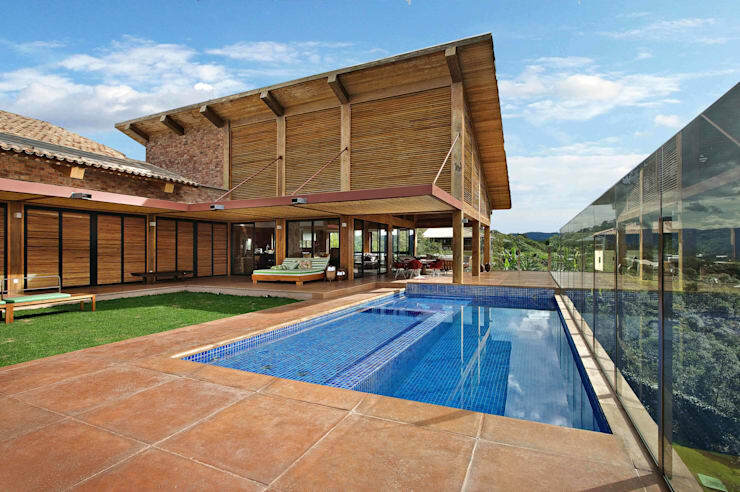 This connects to a large cantilevered roof that extends towards the pool area. 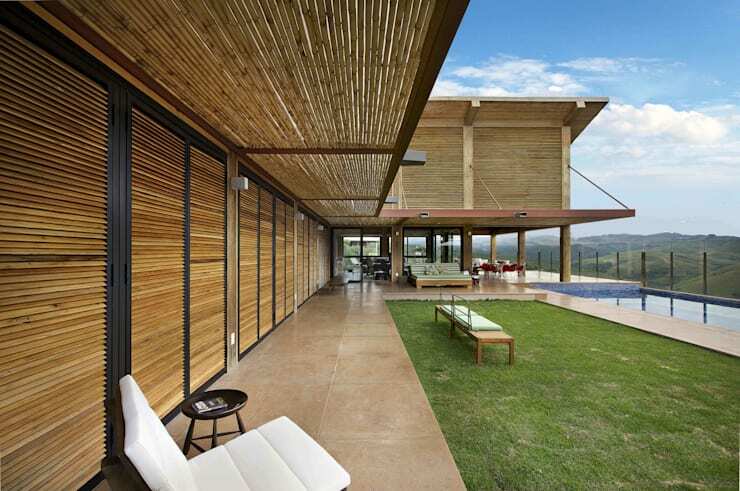 The roof is made of a steel structure and the bamboo and polycarbonate offer shading. The idea was to create a space with the atmosphere of a village. The living room enjoys stunning views of the surrounding landscape. 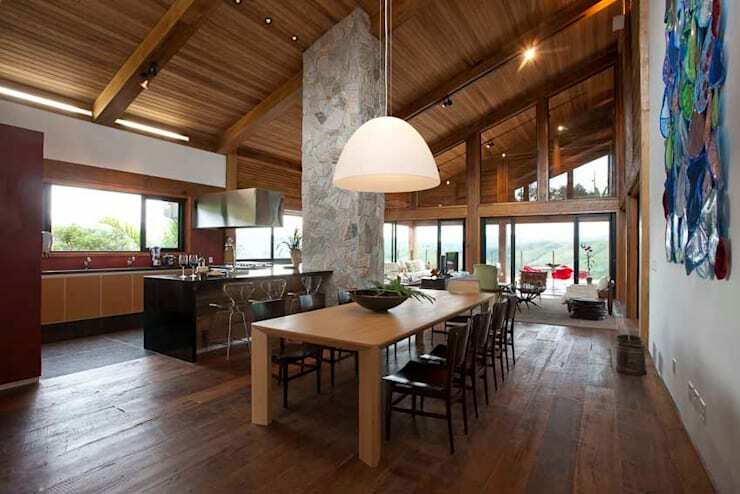 The wooden floors and high ceilings make this an earthy, rustic living room. The furniture is an eclectic mix of pieces by Brazilian designers. Each item was chosen to reflect the personal preferences of each member of the family. They form a cohesive connection because of their common low height and the elements of lightness and fluidity. This was a deliberate choice to allow the landscape to dominate the interior ambience. All living areas were developed on this one single level to face the mountains. So this dining room is connected to the kitchen, living room and even the outdoor areas in the distance. A common issue with this kind of open-plan layout is noise. But here, the architects have used wood on the floor, walls, ceilings and even the massive wooden doors to promote noise absorption. 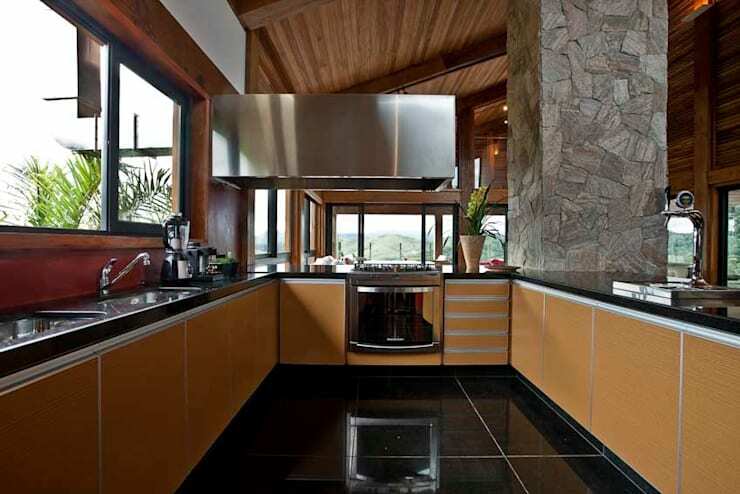 The kitchen is designed with a strong earthy colour palette. The stone fireplace to our right and the natural views on our left complete the rustic ambience. But the cupboard doors are modern, streamlined and there is a prevalence of chrome and stainless steel. The glossy black tile floor adds another modern layer. In all, this kitchen is the perfect fusion of rustic and contemporary living. 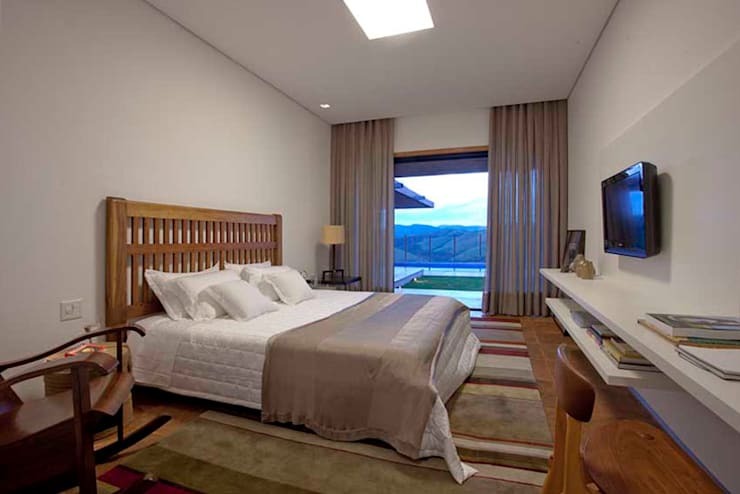 The bedroom has magnificent views of the mountains. But this is no show home, the bedroom has been furnished for complete comfort. The subdued colour palette is comforting and there is even a rocking chair on our left! If you're in the mood for a little more decadence, you'll love The mansion with spectacular secrets. What do you think of the natural connections which inform the design of this home? Let us know your thoughts in the comments field below!